Welcome to the Flitter! User’s Guide. If you need further help or wish to make a correction here, please use our forum or email support@dyerware.com. Flitter! allows you to download and read RSS feeds and tweets. What is a feed? Twitter accounts, web sites, and blogs typically experience one or more updates a day, and you may find yourself bouncing to and from your favorite web sites to check for new posts. Most web sites today publish their updates in a format called “RSS” or “ATOM”. They typically advertise this fact somewhere on their site, usually with an orange “RSS” icon of sorts. With Flitter! you can peruse all of your favorite websites’ updates with the push of a button. You will be notified which of your websites have new articles, and can read them in a highly readable format directly within the application. You can even visit the full original article on the web, or interact with web links and images of a news article if you wish. But Flitter! has more tricks up its sleeve than a simple reader. You can search across all of your downloaded articles as easily as using Spotlight. You can even configure how many articles or tweets you want to keep per entry. And yes, there is also the matter of Twitter integration. Not only can you subscribe to and read Twitter user posts, you can enter your own Twitter account in the settings page and can then “tweet” any article or web page you like, or compose a Twitter reply when reading someone else’s tweet. Read on through this tour of the application, and please provide any feedback if we missed something. The page mostly consists of a large list of web page links, twitter accounts, and web RSS feeds. You can create any mixup of content you wish. We refer to these front-page items as “entries”. Touching an entry selects it and takes you to the Article List page where all of the downloaded content is available to you. To the left of the entry name is a little icon of your choice. You can pick from dozens of pre-built icons or have Flitter! 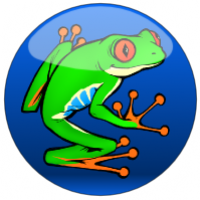 download the website’s own icon artwork for you (such as the Futurama example from above). When you download new data, the indicators on the right of each entry become “busy” indicators, signifying they are working hard to download their content. Each entry works independently from the others and, should one conclude its work before the others, you may select it to read its articles. If an entry experiences an error, you may still select the entry and read its contents just as you normally would. The indicator is only informing you that there was a failure in communicating with the site. These are called “autosearches”. They work similar to RSS and Twitter entries, however they show you entries across your article database with particular attributes. When you enter an autosearch, its items technically belong to other entries, so the original entry title is displayed alongside article titles for your convenience. Below is a description of each autosearch. 1. Article Flags. This autosearch will show you all articles that you have flagged for later reading. You can learn how to flag an article in the article page section later on, but for now just know that you can easily get to all of them with the touch of a button on the main page. 2. Unread Articles. This autosearch is a fast way to get to all of your unread articles regardless of what entry they belong to. 3. Article Vault. The autosearch allows you to browse all of your vaulted articles. You will learn how to archive an article into your vault in the Article Page section, however just note for now that this is a special long-term copy of any RSS article you want to keep. 1) The Refresh button. Pressing this initiates the downloading of new RSS and Twitter content. 2) The Search button. Selecting this will take you to the global article search page where you can search for phrases and text across all of your content. 3) The Checkmark button. This button will mark all of your articles as having been read. The entry indicators will disappear as well since you have “read” all content. This button will prompt you before taking action, so don’ t worry if you accidentally touch it. 4) The Help button. This button appears on more than one page in Flitter!. It will provide you a mini tour of some of the features of the page. 5) The Settings button. 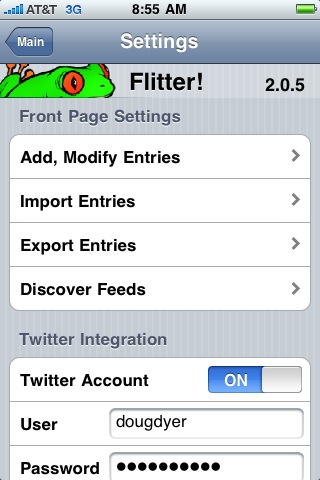 This button will bring up the settings page where you can configure Flitter! to your liking, including adding or editing the entry list. And finally, feel free to rotate your iPhone to any orientation you wish. There are precious few pages that require a particular orientation. First you will notice there is a title at the top. This is the name of the entry. To return to the main page, touch the button on the top left labeled “Main”. Each article is shown by its title and publication date. Some articles have an icon indicator to the far right of the date. A sticky note signifies the article is unread, while a sticky note with a green “+” sign signifies an unread article that is newly downloaded. 1) The Trashcan button. This button will delete all entries from this feed. It will prompt you first of course, so don’t worry if you accidentally touch it. NEVER WORRY ABOUT DELETING ARTICLES: OLD ONES WILL BE REMOVED TO MAKE ROOM FOR NEW ONES AUTOMATICALLY. CONFIGURE HOW MANY ARTICLES TO KEEP AT ANY ONE TIME FOR A PARTICULAR ENTRY IN THE SETTINGS AREA. 2) The Checkmark button. Similar to the one on the main page, this button will mark all articles of this feed as being read. Once done, you are returned to the main page. This button will also prompt you prior to making any changes. At the top of the article page resides the article title and publication date, and below is the article content. If the article contains any images they will be downloaded at this time. Note that by having selected this article, it is now marked as read if it was a previously unread article. This page’s title is simply “Article”. To return to the Article List page, touch the button with the entry name in the upper left. Let’s go over each item of this page. At the page top is a set of numbers (in the example above “30 of 30”), and two special up/down arrows. If you are viewing a feed or the results of a search the number tells you where you are in the results and the total number of articles within the search results. The up/down buttons allow you to quickly walk the next and previous articles. Each article begins with a header of information consisting of the article title, its publication date, and the entry icon you have associated with the entry (and is also shown on the main page). In this case for a Lego RSS feed the user has chosen a hammer. Below the header is the article body itself. Some articles, such as tweets, are merely header titles. If this is the case, any URLs within the tweet become selectable. Other articles however may be rich in web content including links, images, and even movies. All are playable or selectable within this page (provided parental controls allow it — more on that later). 1) The Tweet/Tweet Reply button. If you are reading a feed and have configured your Twitter account with Flitter! (on the settings page), then this button is selectable. Touching it will first prompt you, and should you approve, the article is tweeted to your Twitter account. Article tweets include the title and a tiny URL. If you are reading a tweet and wish to reply back to the user (and have your Twitter account configured), the button is again unghosted but also has a reply indicator. Touching it will bring up a Compose Reply window shown below. Here, you may type your message back to the user and either hit “Cancel” in the upper right to abort, or hit the “Send” button on the keypad to send the message. Given the size-limited nature of Twitter messages you are provided the number of characters remaining count above and to the right of the message area. 3) The Compose button. This button will allow you to email an article or tweet to anyone you wish. Email occurs within Flitter!, including access to your contacts database. Note that the email will contain the article title (or tweet) in the subject, the article link in the body, and the article body itself including any rich HTML content should there be any. 4) The Padlock button. This button saves a copy of the article to your Article Vault, a special reserved entry on the main page where you can place articles you want to keep long-term. As usual, you are prompted first. 5) The Flag button. Toggle this button to mark or unmark the article for later reading. As of Flitter! 1.2 you can easily revisit all flagged articles from a special entry on the main page. This is a convenient feature for when you find yourself quickly scanning articles and see one or two you want to spend more time with later on. 6) The Link button. This button takes you to the Flitter! built-in web browser to view the article in its original form. You can also jump into the web browser by touching on any link within an article. The web browser contains a few features worth mentioning. It is invoked whenever you launch an entry from your main page that happens to be a web link, or when you touch on a link within an article, or when you wish to visit the web page for a particular article. Lets take a tour of the page. You can see the now ubiquitous upper-left button to return to the last place you were in Flitter!. In this case, the Article page. At the very top is the URL. You can edit the URL directly if you wish. The button to the right of the URL can appear in two styles: A blue reload button for reloading the current page, and a red stop button which allows you to abort the loading of a web page. Interacting with the web content works just as in your iPhone Safari browser: Pinch and zoom, pan, and touching on items all are identical. To copy items such as graphics or links to your clipboard, touch and hold down for a few seconds to receive the special clipboard menu. 1) The left and right buttons. These offer traditional “back” and “forward” web page navigation. Here, you can tweet the web page (the page Title and link will be included), email the link, or add the website to your front page. Each option will prompt you prior to taking action. 3) The Monitor button. This toggles “full screen mode” where you can view the current page without any Flitter! menus in the way. To exit this mode, touch the Flitter! logo at the lower right corner. This mode is great for web-based games and apps! Below is a picture of the mode. As you might expect, touching the “Main” button in the upper left corner will return you to your main page. As you enter text the search happens in real time to narrow the entries that contain your phrase. At any time you can select an article to read, which will take you to the now familiar Article page. When you return from the article, you will be back in the search dialog exactly where you left off. Note the icons along the right side of each article. These are the same Unread/New indicators as seen in the Article List page. Also, note that the Entry name and Article post date is visible below the article title. These fields are not part of the search but are included for your convenience. You can specify whether your search text should be applied to the article Titles (the default), the article Body, or both. Be careful when searching article body text as Flitter! will search even hidden HTML tags (if the article includes them). To exit the search mode, touch the “Cancel” button in the upper right. The settings page, available by selecting the gear icon on the main page, contains a series of settings for you to tailor Flitter! to your liking. And now, the tour! First you will notice the version number at the top. Include this number in discussions or forum posts if you need support from us so we are sure of what you are running. Below the version number are a series of options grouped by title: “Entry Configuration”, “Twitter Integration”, and “Miscellaneous”. Lets provide an overview what each of these are for before going into more detail. Entry Configuration The “Front Page Settings” options allow you to configure your list of items on the Flitter! main page: Web bookmarks, RSS feeds, and Twitter users. “Add, Modify entries” will take you to the Edit List page. There you will be able to rearrange the entries as they appear in the main page, delete entries you no longer want, add new entries, or tailor an entry’s settings. “Import Entries” will take you to the Import Options page where you can import a list of Flitter! entries from other Flitter! users or other means. “Export Entries” will take you to the Export Options page where you can share your Flitter! configuration with other Flitter! users or compatible applications. “Discover Feeds” allows you to browse and pick and choose from a database of hundreds of RSS feeds from dyerware’s archive. 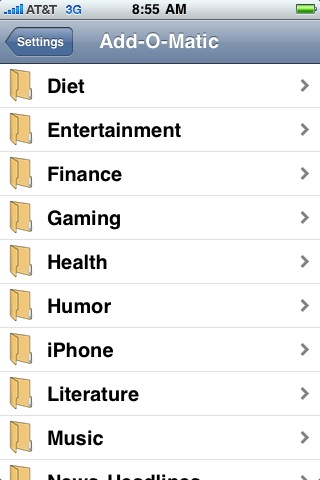 The list is sorted by category, making it easy to locate feeds of the type you are looking for. Twitter Integration “Twitter Integration” allows you to enter your Twitter user and password information. This is not required, but it makes available to you the Twitter features discussed in this manual. Please note that the Flitter! configuration settings stay private on your iPhone. No information is shared back to us. Your Twitter account is only used to log in to the Twitter service. “Newest Articles First” allows you to view a feed’s article list from either newest-to-oldest (the default) or oldest-to-newest. “Create Thumbnails” will manufacture thumbnails for an article if the article’s RSS definition did not specify one. This is done by downloading the article’s first image (if there is one) and scaling it. Turning this feature off can improve article download times but you will loose thumbnails for most feeds as few currently support native thumbnails. Miscellaneous Under “Miscellaneous” you can set up Parental Controls (more on that later), or select “Support” to get a wide variety of support and reset options..
Expect the features on this page to grow over time as we add settings. 1) The Magnifying glass. This button invokes Feed-O-Matic, an RSS feed search tool which will be explained later. 2) The Help button (“?”). This button will bring up a mini tutorial tour of the elements on this page. 3) The Plus button (“+”). The plus sign adds a new blank entry with which you can tailor to what you wish. This new entry will be added at the top of the list. Along the top of the Edit List page is a button labeled “Edit”. Touching this will allow you to delete or rearrange the entries in your list. Note that when you touch the Edit button it changes to read “Done”. When you are finished deleting or rearranging, press the “Done” button. You can also swipe-to-delete an entry when you are not in “Edit” mode. The delete button is the red circle. Press it and Flitter! will present you with a Delete confirmation button. A touch of the confirmation “Delete” button and the item will be removed. To change your mind, select something else on the page or touch the red circle button again. Note that special entries such as your Article Vault are not deletable and therefore only contain the move indicator. The move button is the boxy indicator on the right. To slide an entry up or down, touch and drag it’s move indicator. To exit the list edit mode, press the “Done” button on the top-right. If you select an entry’s blue details button on this page you will be taken to an Edit Feed page where you can highly customize an entry’s settings. You know how to add and remove an entry, but what about changing it to something you want? When you are at the Edit List page and not in edit mode (i.e. you do not see the blue “Done” button in the upper right), each row is selectable. Touching a row will take you to the Edit Feed page. This is a pretty fun window. You will be able to edit the name of the entry, it’s type, the URL (or Twitter username), the maximum amount of articles you want archived, and an icon of your choice. The entry name is for you only. Call it whatever you wish to remember the entry by and this will be what is shown in the main window. The Type option however is more involved. There are three types of entries supported: Feed, Twitter, and Web. “Feed” indicates that the URL points to an RSS or Atom feed. Selecting “Twitter” will change the URL field to say User. Here, you will need to enter the Twitter username you wish to add. “Web” allows you to enter a regular web page you can access from the main page. When a web page entry is selected, a web entry launches the internal web browser. You can create a mix of feeds, twitter users, and web pages you like to monitor. With Feed and Twitter types you can select how much storage you want to dedicate to the entry. Use the slider to select from 5 to 100 articles. Flitter! will keep as many articles as it can. Once you exceed your configured limit, Flitter! will start to delete the oldest articles as space is needed. All three types allow for you to pick an icon to associate with the entry. Flitter! comes with many attractive internal ones, however if you wish to use the icon of the Feed or web site, use the first entry in the icon picklist called “<Use Site Icon>”. When this is chosen, Flitter will access the URL and download any logo icon if present. In this manner, “www.cnn.com” would have the CNN logo. The Advanced button will pull up the Advanced Options page where you will be able to tweak and set some special entry options. To save your changes, touch the “Save” button at the top right. If you change your mind about your changes, you can cancel out of them back to the Edit List page by busing the upper-left navigation button. The Advanced Options page allows you to modify some important but rarely used entry options. Pass Code Lockout allows you to lock out access to this item when Parental Controls is turned on. The user will be presented with the Flitter! Passcode Unlock screen to gain access. If this is enabled (along with Parental Controls), the passcode unlock screen will be enabled for Feed Article searching as well since any database content potentially has private material. URL Account Option items allow you to enter a URL user and password that are needed to gain access to authenticated RSS feeds. Attachment Account allows you to access authenticated podcasts. It is possible you need both the URL Account and the Attachment Account options configured to gain access to the desired material. RSS feeds are everywhere, but how about your favorite web sites? While it is not infallible, Flitter offers an RSS feed scan of any web site and reports back a picklist of feeds available. To access Feed-O-Matic, touch the magnifying glass on the Edit List window. You will be presented with a text box to enter the URL of the site of interest. For a demonstration, enter the URL “www.apple.com” and hit “Go”. The web page will be scanned and, after a few seconds, a list of feeds offered will be shown. If no entries are shown, then no feed is being advertised by the site. There may still be a feed offered by the site, but the auto-detection mechanisms are not reflecting this. In fact this is quite common, so do not be discouraged if Feed-O-Matic does not find anything. In our example, the Apple site will return with one entry labeled “RSS”. Many web sites offer only a few feeds and name them by the format of the feed. You can rename them to something more personal in the Edit Feed page. There is a checkmark to the right of the Apple RSS feed. Any checkmarked feed listed indicates to Flitter! that you want that feed. To change the state of the checkmark, touch an entry and the checkmark is toggled on/off. You use this mechanism to pick which feeds listed you want added to your entry list. If you don’t want any, simply navigate back by pressing the upper left button. If you want one or more feeds added, ensure they are checked and touch the “Save” button in the upper right. If you are using a Lite version of Flitter! you may be limited in the number of entries you can add. If so, as many of your selected feeds as possible will be added, and you will be prompted only if you exceed the limit. 3) The half-checked Box This will invert your checked selection. 4) The Help button (“?”) This will bring up a small help tour of this page. With Flitter! you can import a list of RSS feeds and web bookmarks from a variety of sources, including other Flitter! users. 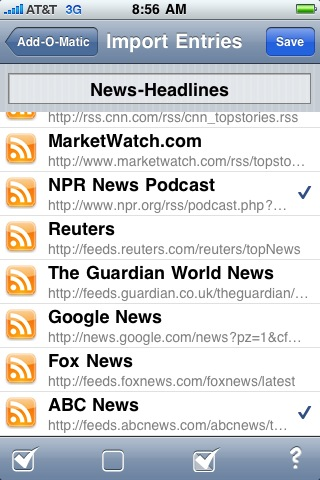 In fact, any RSS reader or web browser that exports OPML file format can be used as a source of feeds. This includes Google Reader and the FireFox browser in addition to many others. Importing from a URL is easy and works much like Feed-O-Matic: Select the “Import Over HTTP Link” option, and in the subsequent window, enter the URL at the top. Flitter! will present you with the list of extracted items to add to your entry list. We will talk about the buttons along the bottom at the end of this section as they are the same for both import options. Incidentally, we are leaving this file present at our site for you to practice with. Just enter “www.dyerware.com/flitter_opml.xml” to try it out! You can now email other Flitter! users your entry list for them to add to their own, or just email yourself for backup reasons. Export As Email is the main option. If you just want to email a human-readable report to someone, use the “Email friendly list” option. The recipient should use the Import by clipboard option to insert the attachment data. Under settings / Discover Feeds is a great feature called Add-O-Matic. You can peruse hundreds of feeds by category and add them to your front page. When you enter Add-O-Matic, Flitter! starts off by downloading the latest category list from dyerware. Below is the category list page. You would proceed by touching the category that interests you. Feel free to suggest new categories to dyerware. Once you enter a category, the latest feeds for that category are downloaded and presented to you. Feeds that you already have installed are not shown. Below is a screenshot from the headline news category. Touch the individual feeds you want to add and they will have a check by them. To save your request, touch “save” in the upper-right corner. If you change your mind about adding, just cancel out by touching the back button. Add-O-Matic is fun and easy. You may find feeds that surprise you. If you want to suggest new feeds to us, please do so! The feature is “live”, meaning we can update the database without releasing new versions of Flitter!. Flitter! contains flexible parental controls to provide restrictions for younger users. Parents can choose the RSS feeds, web bookmarks, and twitter users they wish their child to have access to, and then lock down certain capabilities with a passcode. This makes the iPod Touch an ideal fun platform for kids to interact with the web as well as educational games. Initially the parental options are ghosted and the top button suggests you “Enable Restrictions”. Select this button and a passcode dialog will appear. Enter a 4-digit PIN twice to lock the controls. Until disabled, the PIN will be required to re-visit the parental controls settings. Remember your PIN. If you forget it, you will have to delete and re-install Flitter!. 1) “Add or Edit Entries” Turn on or off the ability to modify, delete, or add URLs. This is perhaps the most important restriction as it prevents your child from inserting new RSS feeds pointing to websites unfamiliar to you the parent. 2) “Navigate Web Links” Turn on or off the ability of the child to visit web links embedded within RSS feeds or web pages that are allowed by the parent. If this ability is disabled, touching any HTML link will be disallowed. 3) “Tweet Articles” Selecting the tweet button at the bottom of a web page or RSS article will present the user with the passcode unlock screen. 4) “Email Articles” Any in-app email option (for example, the email button at the bottom of an RSS article) will present the user with the passcode unlock screen. If Parental Controls are enabled and any Flitter! entries are configured with “Passcode Protect” option (see Advanced Options under the Edit Entry page), then accessing that entry from the main page will present the user with a passcode unlock screen. Further, any autosearch or search access will also require the passcode as potentially any private material will be present in the Article database. Parental Controls are useful beyond just safe browsing for children. One common usage of Parental Controls is to enable all options except the Tweet and Email ones. This allows you to hand your iPhone running Flitter! to others without the concern that they may accidentally send email or tweet something using your account. If you want to provide feedback or need some support, this page will assist you in some direct-to-dyerware options. It also will allow you to completely purge your article database if you think there is a lingering problem. Selecting “Email Support” will bring up an email dialog with some inserted basic configuration statistics. Edit and append your question to your liking and send it to us. We will do our best to help. Purging the database will delete all downloaded content, including your article vault. This may be recommended by support if you are experiencing problems. Well, that completes our tour through the Flitter! application. Thank you for your purchase, your patronage is important to us and we want to earn your future business. To that end, all too often a purchase can fall out of favor or disappoints. Don’t let that happen with us! We want to know what we can do to make Flitter! your favorite app. Please use our forums or email us if you have any feedback. An easy way to supply feedback is to go to settings/support and you will find a handy in-app email support button!